Wednesday's grand finale of our early September heat wave produced a new record high temperature at Newark Airport: a sizzling 98 degrees! That broke the previous record for that date of 97 degrees, set in 1983. It’s also tied for the hottest day of 2018 so far (along with July 1), and represented EWR’s 36th 90-degree day of the year. The heat and humidity are now gone. The thunderstorms are now gone. And the cold front is through. That means we have a very different weather pattern setting up over the next several days. We’ll see below-normal temperatures, thick clouds, and occasional rain through the weekend before the remnants of Gordon and then Florence complicate the forecast for next week. No more 90s! Heck, even 80s might be a stretch for the next several days. Cooler temperatures are settling over New Jersey on Friday. While I’d love to present a crisp, dry, truly autumnlike forecast, the outlook remains a bit bleak through the weekend. The aforementioned front has stalled just south of New Jersey. As we’ve seen countless times throughout this soggy summer, that will provide an “express lane” for mini storm systems to pass overhead. Unfortunately, the precise timing of these shortwaves is impossible to pinpoint. But let me try to give you a day-by-day overview of how this might play out. Friday will feature a mixed bag of weather. It's still a bit humid to start, with morning temperatures in the lower 70s. A few showers and thunderstorms will likely break out as the day presses on, mainly (but not exclusively) impacting the southern half of New Jersey (say, south of Interstate 195) throughout the day. Skies will be mostly cloudy, keeping temperatures stuck in the upper 70s all day. There is a reasonable chance that sunshine breaks out, which could bump thermometers into the 80s — especially the further north you are. Saturday and Sunday get even cooler, with forecast high temperatures in the upper 60s to lower 70s — way below normal for early September. Periodic light to moderate rain is expected, again especially around (but not exclusively in) the southern portion of the state. I’m seeing a brisker breeze for the weekend too — 10 to 20 mph, out of the northeast. It's not going to be a weekend washout, with breaks of dry weather possible. 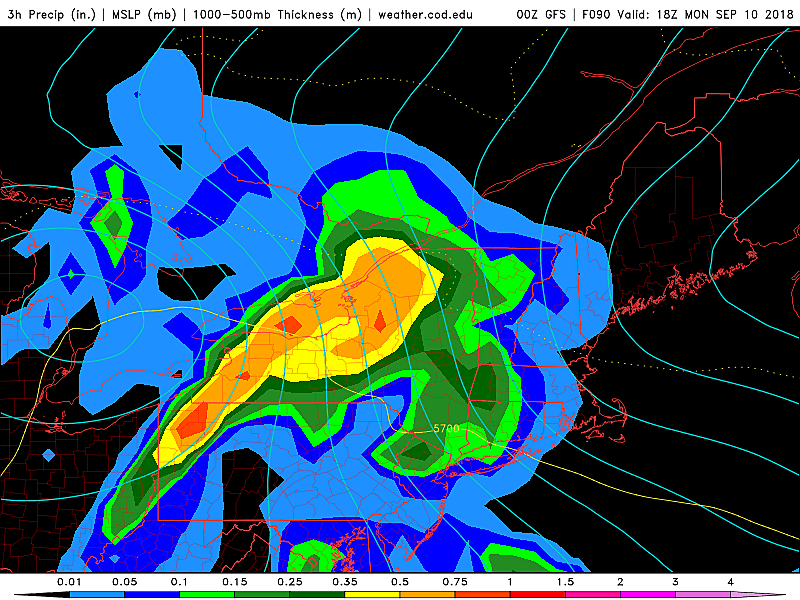 Right now, it appears the best chance for a rainfall pause will be from Saturday afternoon through early Sunday morning. While it won't be great beach/pool weather over the weekend, you might catch some snippets of boardwalk/backyard weather. Overall, rainfall totals should end up between a half-inch and an inch across New Jersey over the next 3 to 4 days. Pretty unimpressive rainfall, I have little to no concern about flooding or severe weather. Just cool, cloudy, and occasionally damp. As Tropical Storm Gordon made landfall near the Alabama-Mississippi border on Tuesday, it delivered upwards of 10 inches of rain, 5 feet of storm surge, and 50 mph winds. Two deaths have been attributed to the storm so far. The remnants of Gordon continued to move inland, got swept up in the westerly jet stream, and (as of this writing) are centered over Arkansas. There had been some concern that this “blob” of rich tropical moisture would pass directly over New Jersey early next week. However, confidence is growing that the bulk of Gordon’s remnants will pass well north of New Jersey on or about Monday. That’s good news for New Jersey’s flooding potential, for sure. I think we’re still close enough to get clipped by some rain, endcapping an already dreary and soggy weekend. And, given the deep pool of moisture associated with storms of tropical origin, we’ll have to be wary for the potential of heavier downpours. As it stands though, don’t expect much here in the Garden State from Gordon. I don’t have much new Florence information or insight to report, since Wednesday’s extra-special MDZ weather blog entry. As of 5 a.m. Friday, the National Hurricane Center reports Florence has weakened to a tropical storm with maximum sustained winds of 65 mph. 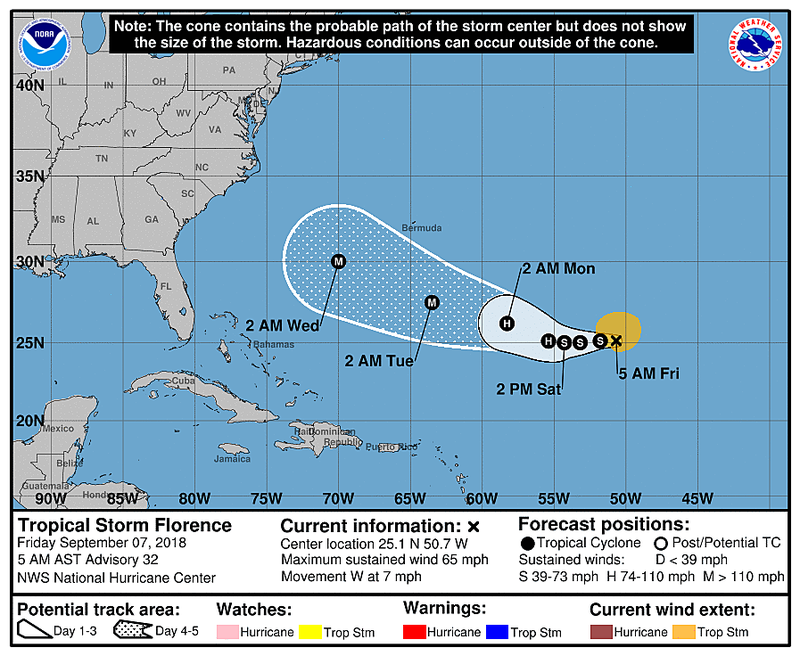 The center of Florence is located about 1,700 miles southeast of New Jersey. As the storm encounters more favorable atmospheric and ocean conditions, it is expected to once again strengthen into a hurricane and then major hurricane over the coming days. Remember we’re still about 6-7 days away from any potential weather impacts here in New Jersey. Forecast confidence is still near-zero. 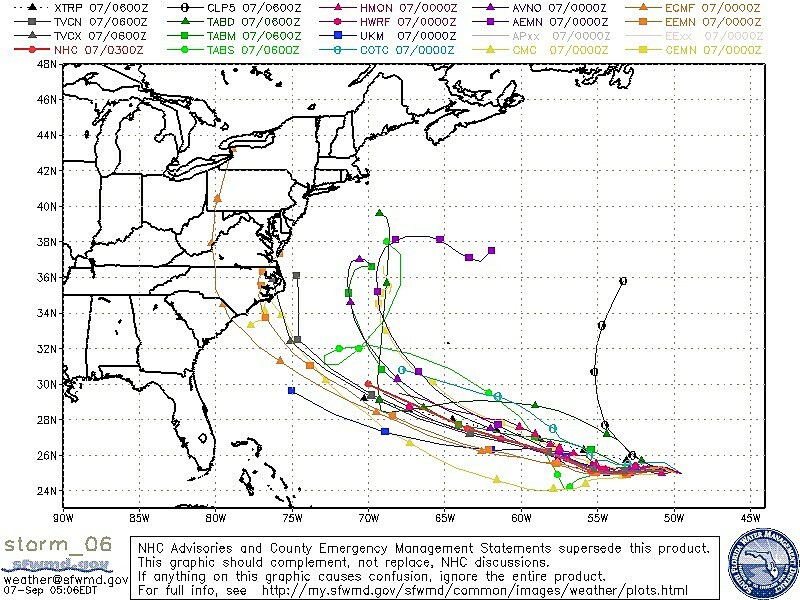 Here’s the latest spaghetti plot as of Friday morning, showing 20 model solutions for the track of Florence’s center. 1.) Out-to-sea... Storm take a sharp right turn and stays over the open Atlantic and away from the U.S. coast. Best-case scenario for NJ. 2.) Near-miss... Storm ends up within 300 miles of the NJ coastline. Surf problems galore, but no rain and little wind concern. 3.) Direct hit... Storm beelines for NJ. Clearly a worst-case scenario in terms of rain, wind, and surge potential. 4.) Inland... Storm hits the coast south of NJ, and the remnants pass west of us. A rain and wind maker, but low storm surge potential. There seems to be a weak consensus favoring either a “near miss” or "inland" trajectory. While that would hopefully spare New Jersey from the worst rain and wind impacts, a hurricane of any magnitude parked just off our coastline could turn pretty bad for the Jersey Shore. I’m still thinking we’ll know more once the storm is about five days away — that would be Sunday, at the earliest. I will provide daily forecast updates each morning. We’ll ramp up our coverage if and when it becomes appropriate. Until then, enjoy the non-90-degree weather and have a great weekend!